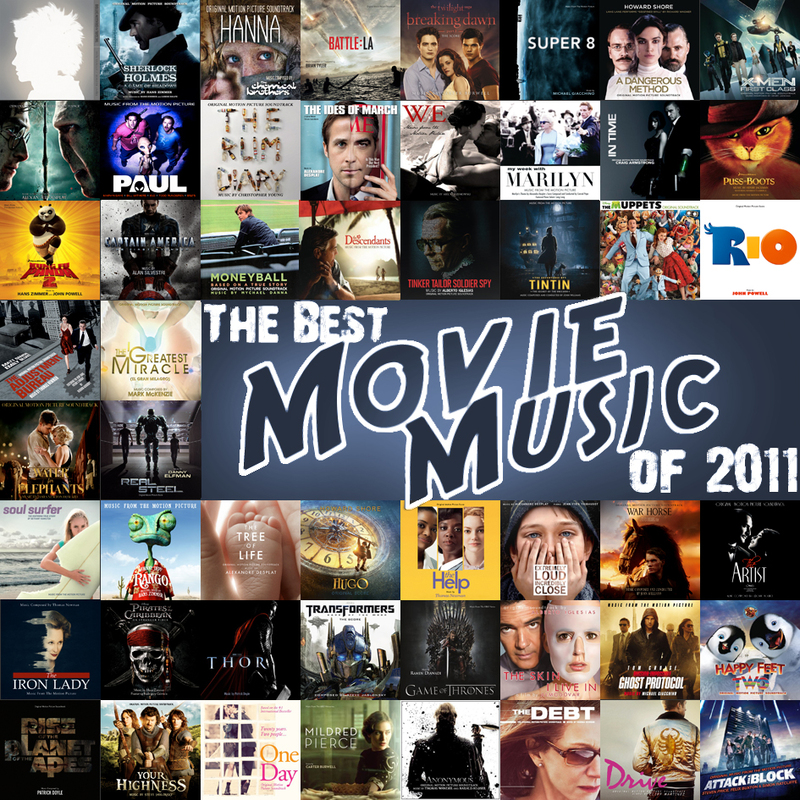 It was quite a year for films, and with great films come (usually) great film scores. After spending hundreds of hours throughout 2011 and the past couple of months roaming around London and Malta with film scores bursting out of my earphones, I have compiled a list of what I think are the particular highlights, to help you navigate the endless available CDs, and maybe pick out a few gorgeous tracks from iTunes or Amazon. Whilst I still love the physical feel of the CD and the smell and detail of the liner notes, it is very true that digital downloads are very handy for those scores which might not be a great album or CD, but have one or two standout pieces worth paying for. John Williams came out of semi-retirement to score Spielberg's two films this year (The Adventures of Tintin and War Horse), both of which got nominated for Best Score, and the latter being probably the best score of the year. Hans Zimmer started the year off with a fun Rango score, and then did three sequels on autopilot - Pirates 4, Kung Fu Panda 2, Sherlock Holmes 2. Danny Elfman had a quiet year, but wrote a fun, sporty score for a film that hardly anyone saw - Real Steel. He also contributed some music to Gus Van Sant's Restless, which unfortunately remains unreleased. Thomas Newman was very busy, providing great (but fairly typical) scores for The Iron Lady, The Help, The Debt and The Adjustement Bureau. Alan Silvestri provided one of the year's best old-school heroic themes for Captain America: The First Avenger. Howard Shore returned to form with one of the year's best scores for one of the year's best films - Hugo, as well as providing a Wagner-influenced score for A Dangerous Method. The hottest composer of the past few years, Alexandre Desplat, was busy as usual. He ended the Harry Potter story on a high, scored The Ides of March, and provided lots of gorgeous pieces for The Tree of Life, many of which were eventually unused. He also scored Best Picture nominee Extremely Loud & Incredibly Close, and contributed a few themes to My Week With Marilyn. James Newton Howard had a green start to the year with The Green Hornet and The Green Lantern, neither of which were very memorable. He provided some great adaptations of Elton John classics for Gnomeo & Juliet, and has a track of saccharine music on the Larry Crowne soundtrack. Thankfully, his score for Water for Elephants got a proper release, and is a wonderful score. Michael Giacchino provided one of the year's best - a nostalgic, emotional score for the nostalgic, emotional Super 8. He also provided a new take on the classic Mission: Impossible theme for the 4th film in that series. Ennio Morricone, who is very understandably taking it easy nowadays, scored an Italian TV film Come Un Delfino. One of the best film composers ever, John Barry, died on 30th January 2011. His last film score was for Enigma, in 2001. it's impossible to do credit to his fantastic body of work in a paragraph, so you might want to listen to the one-hour musical tribute I hosted back in February last year. Ludovic Bource came out of obscurity to provide a great, obviously prominent score for The Artist, which has won many awards and will probably win the Oscar tonight. The director chose to use Bernard Herrmann's famous music from Vertigo in the climactic scene, but the rest of the film owes a lot to Bource's magic. I also included two wonderful TV scores that arrived in 2011 - Carter Burwell scored the miniseries Mildred Pierce, and Ramin Djawadi composed the already famous theme for Game of Thrones. The Chemical Brothers scored Hanna. Basement Jaxx members scored Attack the Block. Rodrigo y Gabriela contributed to 2 scores this year - The Pirates of the Caribbean sequel and Puss in Boots. Trent Reznor (from Nine Inch Nails) and Atticus Ross followed up their acclaimed score for The Social Network with a similarly atmospheric, but less listenable score for The Girl in the Dragon Tattoo. All 9 Best Picture nominees are included, except for Midnight in Paris (no original music released, as usual for Woody Allen's films). All 5 Best Score nominees are included - War Horse, Tintin, The Artist, Hugo and Tinker, Tailor. The Artist will most probably win tonight, although I really hope War Horse or Hugo do instead. Still, for once all 5 nominees are very good scores this year. The Best Song nominee from The Muppets is included. The other nominated song is from Rio, which is represented by a score track. Enjoy! There's lots more where those came from, so if you like a particular track, you might want to check out the entire score.